- Power Source: From standard USB devices, power bank, mobile charger, PC, etc. How to Install the lamp? - Slightly touch the Switch to turn ON / OFF. - Brightness Setting: Turn on the light, hold down the switch for seconds to set. HIGH QUALITY : this desk lamp is made of silvery metal, bright bulb will last long, Great for Desks, Music Stands, Pianos, Reading, Cabinets, Crafting and Kitchen, etc. CONVENIENCE : never occupy any desk space but brightening your whole desktop with natural light. 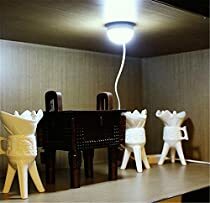 USEFUL EVERYWHERE : this desk lamp can be used in your nightstand while reading, garage, computer table or in your car and many other places. EASY TO USE : stick to magnet-applicable place or with 3M adhesive plates, no tools or screws required. ENERGY-SAVING : DC 5V 1A low power. Compatible with all standard USB devices, power banks, mobile chargers, PC, laptops, computer, etc.